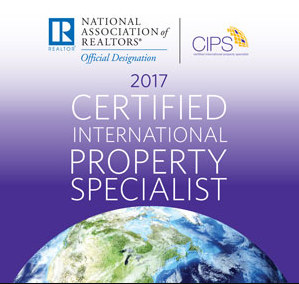 Janet has earned the elite designation of Certified International Property Specialist (CIPS) through the National Association of Realtors. Only about 3500 Agents throughout the world have gained this distinction through dedication, study and commitment to better serving the international community in their real estate transactions. For those who transfer money internationally whether for Real Estate, tuition, or any other reason; Janet has options that can save a huge percentage in currency exchange rates. clients seeking residential or investment real estate. needs of global and relocating clientele. Through strategic international partnerships to help facilitate real estate transactions around the world. With listings that are viewed worldwide through the power of the Proxio network, the international MLS. As a Keller Williams Global Property Specialist, Janet has the knowledge, the network, the research and the tools to offer superior service. As a CIPS designee, Janet is recognized internationally as having earned an elite membership to a group of agents who recognize that foreign real estate transactions are not the same as domestic transactions. She has the ability to confidently guide international clientele through the process. Janet maintains membership in FIABCI, the International Real Estate Federation, a further network of real estate professionals. Her six years on the board of FAUSA, a repatriation organization, has made her sensitive to the needs of repatriating families. Use Janet Darrow as the first point of contact when you are looking to buy or sell at home or abroad. She will make sure that you are paired with a savvy local agent with international experience. If your move is taking you to Southern California, she will personally assist you with all aspects of your home purchase or sale with knowledge, care and skill. Janet is never too busy for international referrals.